Nov 1: You sit down at your computer like it’s New Years Day, full of resolve and good intentions. You know that you need to write 1666.67 words a day to hit your goal of 50,000 words. Of course, you’re not going to stop mid-word, so you write 1667 complete words because you’re a champ. Nov 2: You decide you need a chart that tracks your progress each day. You spend 45 minutes looking for the right one online, then decide to create your own. Having just used up an hour of writing time, you write 512 words with a promise to make it up tomorrow. Nov 3: Great day! You write over 3,000 words. You charge ahead, thinking, “I am totally going to win this thing!” And then you have a drink to celebrate, because that’s what writers do. Nov 4: Ouch. How many glasses of wine did you have? You trudge to your computer and write a half-hearted scene where the main character discusses hangovers in depth. It’ll have to do. Nov 5: Okay, back to work. Luckily you thought through your plot enough that you know what comes next. You plunge forward with a speed and stamina usually only enjoyed by a Kenyan runner at the Olympics. At this rate, you’ll be done before Thanksgiving! Nov 6: Now where were you? Wait, the plot took kind of a left turn yesterday. You re-read your pages. You know you shouldn’t stop to revise, but if you can just fix that sinkhole that opened up in the story, then you can keep going. Nov 11: Okay, the plot is fixed. Finally. Now you only have to write 2,105 words a day. That seems doable. Some woman named Janet has shown up, breathing new life into your manuscript. She has nothing to do with your plot, but boy, does she talk a lot! Nov 18: You have your first flicker of doubt. 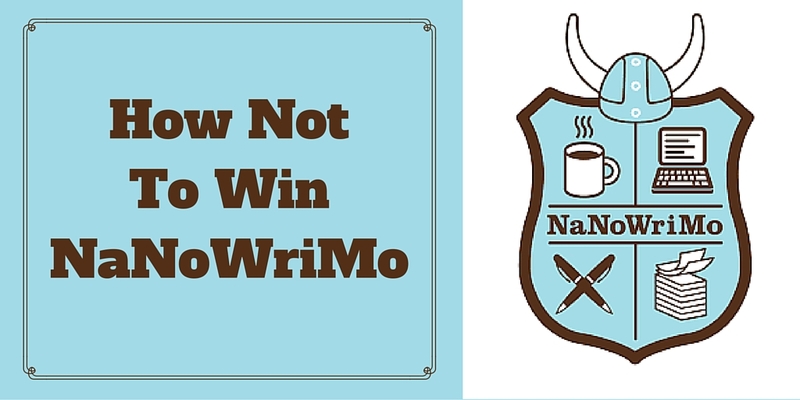 Why do you need to “win” NaNoWriMo, anyway? I mean, you don’t win anything. It’s not like they give you a trophy. Not a real one, anyway. You think of Water for Elephants and you squash those feelings down. Besides, you’ve told everyone you’re doing it, so you can’t stop now. Nov 21: You’re still behind, but don’t worry! You can always use extra modifiers to get your word count up. This makes it very, very, very, very, very, very, very, very, very, very, very, very, very easy. Very. Nov 23: You start cutting and pasting emails you’ve written into the text because they are words and you wrote them and damnit, they should count. Nov 24: You’re making progress. You’re not hitting your 2,105 words a day, but the words are piling up fast. You don’t even want to know what your revised daily quota is. Not yet, anyway. Because you’re pretty sure you have the new Water for Elephants on your hands and you don’t want to kill the mood. Nov 25: This is serious. We’re in crunch time now. Thanksgiving is tomorrow and you still have to go buy all the ingredients for stuffing. The store is a madhouse. Why is NaNoWriMo in November anyway? Nov 26: Thanksgiving. Who writes on Thanksgiving? You lounge on the sofa in a tryptophan-induced food coma. You get up eventually, but it’s just to get more pie. Nov 27: You laugh at all the people lining up for Black Friday. “I’m going to use my time productively,” you think. You sit down to write, but first, you might as well see if there are any good deals online. Six hours later, your Christmas shopping is done. Nov 29: Sunday. Only 9,348 words to go! You write like the wind, inflating descriptions with wild abandon. You describe every article of clothing worn by every character. You consider copying and pasting Wikipedia entries into your text, but that would be wrong. So instead you have your characters summarize them. Nov 30: Blind desperation. You don’t even know who your characters are anymore. You write feverishly, and words pour from your fingertips by the thousands. You finish the day with only 4,128 words left to hit your goal! Nov 31: Wait a minute? November only has 30 days? Damnit! Congratulations to this year’s NaNoWriMo participants! Marla Cooper is the author of Terror in Taffeta, a humorous traditional mystery about a destination wedding planner who is called on to investigate when one of the bridesmaids drops over in the middle of the ceremony. Coming March 22, 2016 from Minotaur Books. Tags: Marla Cooper, NaNoWriMo. Bookmark the permalink. * I don’t draft well. I’m a pantser with compulsive revision tendencies. This might be a good time for me to plug Camp NaNoWriMo, which is in April and July. You get to pick your own word count goals and you can form virtual cabins with other writers. I loved it! Won in 2013 with wild abandon. Life crisis in 2014 hit me like a ton of bricks. I. Will. Win. 2015 (already ordered the shirt and everything). Booked time at the cabin in the woods. Premade several meals. Told a dozen people “Don’t expect me in November”! I love it! You are set up for success! Love it! Sounds pretty accurate. Too funny! That would be me if I were brave enough to take the challenge. Thanks for the early morning giggle. Ha! This had me cracking up 🙂 Love it! Yes! I think you absolutely should! Thanks for stopping by, Donnell! ha ha ha! Too true. Thanks for the laughs just when I needed them. You’re welcome! Happy Halloween and Happy NaNoWriMo!